The Carrion Crown Player’s Guide gives players all the spoiler-free information, inspiration, and new rules they’ll need to create characters prepared for the horrors of the Carrion Crown Adventure Path. Within, players of this campaign will find everything they need to create character backgrounds tied to the grim events that kick off Pathfinder Adventure Path’s most horrifying series, along with new campaign-specific traits to give bold adventurers the edge they’ll need to take on the frightful country of Ustalav’s myriad menaces. New rules for employing the Harrow Deck also put the mystery and magic of that fateful fortunetelling device at the players’ disposal when they’ll need it most. 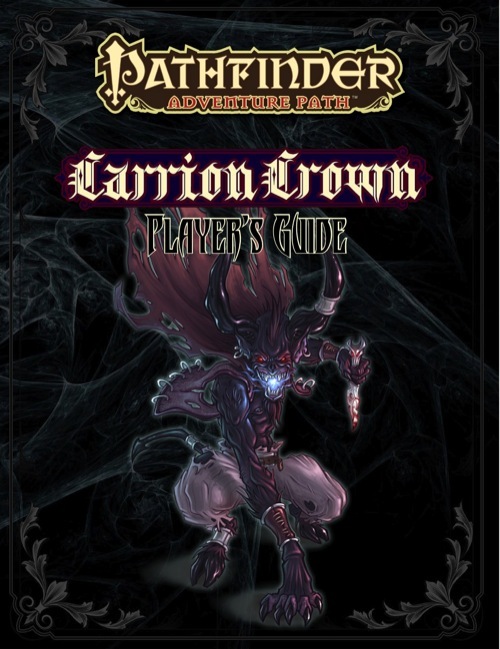 Adventurers need not venture into the darkness unprepared—gather your courage and let the Carrion Crown Player’s Guide be your first step into the nightmare of the Carrion Crown. Though the guide contained excellent information about how to create an enjoyable player for the entire campaign as well as relevant and balanced traits to tie a character to the initial action, I felt they lacked the support for designing a character with long-term attachment to the story. It DID contain some truly interesting information about a multitude of character design aspects, from race to class to background. Definitely worth a read by everyone who plans to play in Carrion Crown, a delightful and well-executed horror campaign. Wow. Some interesting hints in there. Paizo, why did you make the front cover of this pretty much all black? You know how much ink that will eat up when you print it? The Harrow Points optional rules are VERY cool! Tom Qadim approves, he does! Creepy and flavoriffic, he proclaims! In my nook, gonna read this tomorrow during my work break. Thanks Paizo. Just read it, have to say i really love you added stuff for the Harrow Deck. finally! so (again) no prep for the courses, but immersion into my fav past-time! I don't read it yet, but thanks!!!!! Just glanced through, but it looks like you really hit it out of the park on this one. Talk about a way to fan the flames of my excitement about the AP. I love these Player Guides. All new traits have been added to d20pfsrd.com here. I love the new changeling race mentioned in the player's guide and I can't wait to see its writeup in part 1 of Carrion Crown. Those magus archetype names also sound neat. Love the Harrow Point mechanic! I was hoping that a Varisian heavy AP would utilize the deck. Thin. Maybe at best it's an homage, but I would hesitate to call it an easter egg. sheet not the permade one. There is a host of free sheets made by 3rd party publishers. I am very much looking forward to this AP. 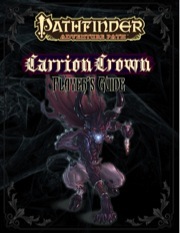 However are you chaps (and chapettes) at Paizo planning on having a dice set done for Carrion Crown? Ah fair enough. Still if that is the case then some nice gothic dice will be worth the wait. I deeply, deeply crave a mini of the (gnome?) witch on page 10.